Before Frank Furness transformed western architecture in the late-19th century, his field seemed to be stuck in the past. “If you were designing a library, you looked to King’s College [at the University of Cambridge] and imitated the forms” of that institution, says George Thomas, an urban planner and architecture historian who lectures at the University of Pennsylvania. “Basically, as you look at the early to mid-nineteenth century in architecture all across Europe and America, you can very quickly tease out the historical sources that were being drawn on.” Opening his office in Philadelphia in 1866, Furness had a different vision that led him to create new forms inspired by industry, Thomas explains. Thomas is organizer of Furness 2012: Inventing Modern, a Philadelphia-based celebration of the architect’s innovative work upon the 100th anniversary of his death. The celebration has included exhibitions, talks, and Furness-inspired street art throughout the city. Click here to see more of Furness’s famous projects. “In the nineteenth century, the premier machine tool-and-die maker in the world is William Sellers, whose business dominates industrial design and wins all the gold medals in the Paris Fair,” Thomas explains. 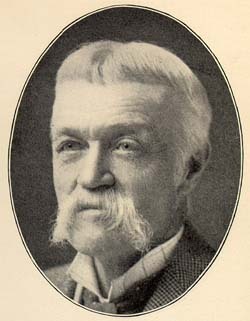 One of his central ideas was that “the design ought to serve the particular task at hand.” His cousin and main designer, Coleman Sellers, lectured at Philadelphia’s Franklin Institute in 1874 about their machines, pointing out that they were painted gray in order to look like the metals from which they were made. He went on to explain that the new purposes of industry demanded new forms. Pennsylvania Academy of the Fine Arts, 1900. Detroit Publishing Company. This image is available from the United States Library of Congress’s Prints and Photograph’s division. under the digital ID det. 4a08450. Furness’s legacy isn’t limited to the buildings across the Philadelphia region that that his firm designed. His students, including Louis Sullivan (who went on to teach Frank Lloyd Wright), George Howe, and William Price, also helped carried the message of modernism into the 20th century. 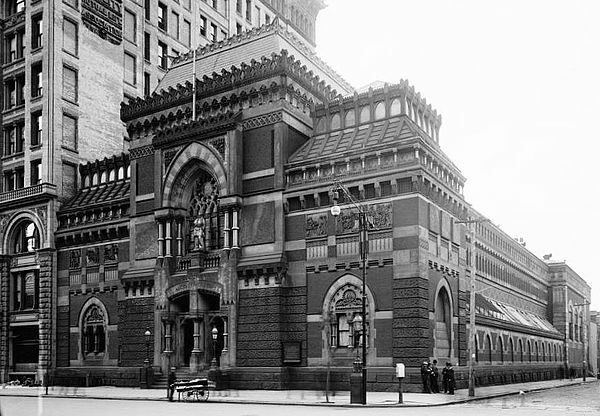 This entry was posted in Architecture, Frank Furness and tagged architecture, Frank Furness, history, modernism, Pennsylvania Academy of the Fine Arts, Philadelphia, research by Susan Frith. Bookmark the permalink.